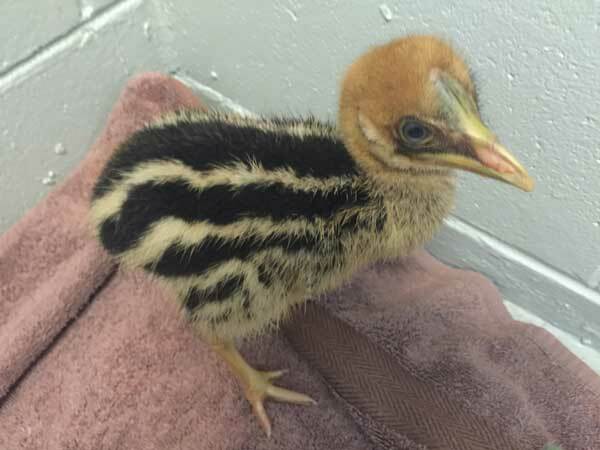 The Cassowary Recovery Facility at Garners Beach is currently home to five chicks and one adult. Two more very young chicks have arrived in the past two weeks. One from Licuala National Park is now eating and running around quite well after ten days. Another chick arrived a few days ago from Hull Heads, found in a back yard going on dark. The owner of the property had never seen an adult cassowary on his property ever before. The chick came into the veterinary surgery quite weak and dehydrated. After an evening of apple, banana and supplements and a quick lesson from the veterinary nurses on how to pick up food off the ground, the chick had made an amazing recovery. A physical exam showed the chick to be quite bright and feisty by morning. The two chicks will be kept in adjacent pens for a week or so until the quarantine period has passed and then they will be placed together so they can grow up like siblings. Yesterday, a six-foot female cassowary was taken to the recovery facility after being hit by a car near South Mission Beach. She was assessed by local veterinarian, Dr Graham Lauridsen, and it is hoped she will make a full recovery. Fortunately, the Department of Environment and Heritage had recently made improvements to the facility so it can once again accept adult birds. You can read more in this media release about the Queensland Government commitment of up to $50,000 for cassowary rehabilitation to keep the Garners Beach centre running. The Department of Environment and Heritage Protection has put out a Cassowary Rehabilitation Expression of Interest to provide for financial sponsorship, rehabilitation services or organisational support at the Garners Beach Cassowary Recovery Facility.